Choosing an Automatic Fire Suppression System | Flue Steam Inc. In order to comply with relevant fire and safety codes, every commercial kitchen must be equipped with an automatic fire suppression system that meets UL 300 standards. This equipment is extremely important for protecting your customers, your employees, and your property. A new automatic fire suppression system is a big investment, but considering that the average restaurant grease fire causes losses in excess of $25,000, the protection offered by a superior system will be well worth the expense. 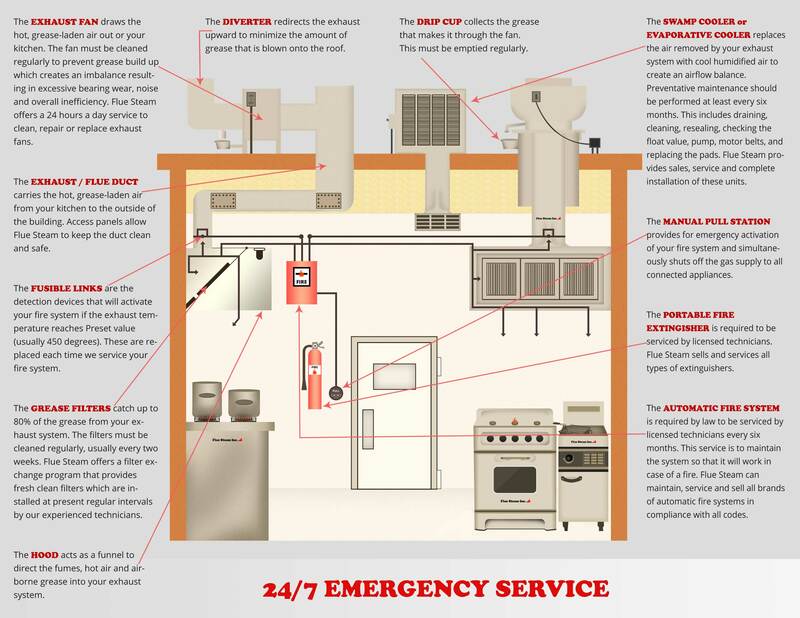 Automatic fire suppression systems work by detecting the high temperatures that indicate a fire in your cooking equipment or your exhaust hood. Once the temperature sensor is triggered, the system automatically releases a wet extinguishing agent to smother the fire and avert disaster. The extinguishing agent should also help rapidly cool the equipment to prevent reflash from causing a second fire. When choosing an automatic fire suppression system, you will likely be looking at offerings from the two major players in this industry, Ansul and Pyro-Chem. Both of these manufacturers offer UL 300 listed equipment. Pyro-Chem products are coming out of a business culture that believes strongly in providing highly tailored fire suppression solutions for a number of diverse applications. For restaurant owners, Pyro-Chem offers the Kitchen Knight II system. The chief selling point of this product is its appliance-specific coverage. Each cooking appliance gets its own nozzle with a spray pattern designed specifically for the type of appliance being protected, whether that be a fryer, range, char broiler, etc. 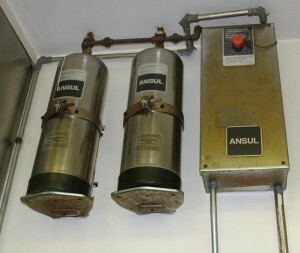 Ansul has been creating highly effective automatic fire suppression systems since 1962, and today their product line features two options, the R-102 system and the Piranha. Both systems offer the choice between appliance-specific or overlapping nozzle configurations. The overlapping configuration is designed to create a “fire-free zone” across an entire bank of cooking appliances. The main difference between the two Ansul systems is the type of extinguishing agent used. The R-102 uses Ansulex, a nearly neutral-pH chemical that is effective against fire while being gentle on your cooking equipment. The Piranha is a hybrid system that uses an extinguishing agent (PRX Liquid Fire Suppressant) plus water to suppress fires. UL testing has shown that the Piranha can cool cooking equipment up to 15 times faster than a standard system, covering hazard areas better while using less chemicals. The end result is more cost-effective protection. For maximum safety, all automatic fire suppression systems should be paired with a portable fire extinguisher. Ansul and Pyro-Chem both offer excellent portable extinguishers for restaurants, as does Kidde. If you’d like help selecting, installing, or maintaining fire suppression equipment for your commercial kitchen, please give Flue Steam a call.